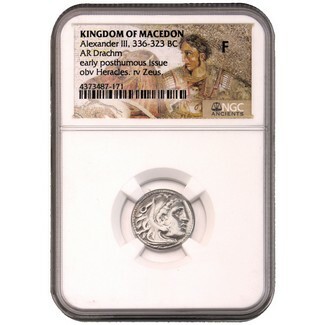 Kingdom of Macedon Alexander III 336-323 BC AR Drachm NGC Fine. Alexander The Great (336-323 BC) Ancient Silver Drachm, with a reverse depicting Zeus holding eagle & scepter. The obverse depicts Head of Hercules wearing a lion skull. Certified by NGC's Ancients department, your coin will be in Fine condition. Approximately 4.3 grams of mostly pure silver.